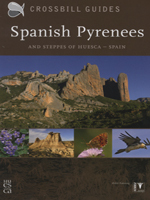 This is the new edition of the successful Spanish Pyrenees and steppes of Huesca - Spain. It covers the central part of the Pyrenees, and the dry steppe plains further south, to the river Ebro a region that roughly coincides with the province of Huesca. Within this region, most of the iconic alpine parts of the Spanish Pyrenees are found. Additionally, some of the finest, desert-like landscapes of Spain are here. This Crossbill Guide covers all aspects of this region: Wildlife and landscape: birdwatching sites, the most intact wilderness areas, the butterflies and wildflowers and geological phenomena. Like all other Crossbill Guides, this title answers two questions: what makes this area so special, and how you can see this for yourself. It includes 21 detailed routes and 26 sites with concrete indications on where and how to find the birds, wildlife and flora.